Vanguard has released details of its new solution for photographers looking for a small, discreet and low-weight travel companion. As an entry-level offering, the brand new Vesta mini range of miniature tripods fits neatly into a pocket, measuring just 18cm when folded and weighs in at a mere 155g. As smartphone camera technology improves (look at the amazing five-camera Nokia PureView 9), users becoming much more aware of image quality and what it takes to get sharp shots. While the range is clearly aimed at users of smartphone cameras, the Vesta Mini models are capable of supporting an impressive maximum payload of 2kg, meaning they can be paired with most mirrorless cameras, along with a standard lens, or even a small DSLR setup. It could be a great accessory for adventure nuts too, as even the best action cameras and best travel cameras benefit from a decent support. 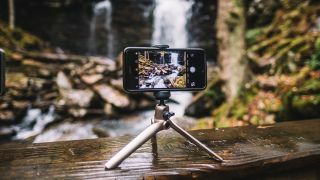 The smartphone focus is supported by the bundled adaptor, which is used to quickly and easily mount a phone in either landscape or portrait orientation. With the legs folded away the Vesta Mini can he hand-held for freedom of movement, but with a lower risk of camera shake and smoother video recording. The adaptor itself can be removed and used remotely to support a phone during live calls, such as Facebook Live or Skype conversations. The versatility of the Vesta range extends into its compatibility with other optical accessories such as sports optics, spotting scopes, binoculars and video cameras. The build quality is all-metal and enables the user to operate freely and with confidence outdoors. Each tripod features rubberised feet to prevent slipping on smooth or wet surfaces and employs a unique leg-opening system, which allows the legs to be unfolded and locked into position in a single movement. To cater for those fashion conscious image creators, the Vesta Mini series incorporates four attractive colours – White, Black, Champagne and Rose Gold. These all feature a 1/4" camera screw thread ball head, and have a recommended price of £34.99 / $44.99 each.